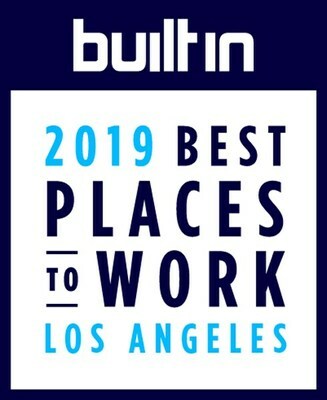 SANTA MONICA, Calif., Jan. 10, 2019 /PRNewswire/ -- Today EZ Texting, the leader in mobile marketing for business, was named to Built in LA's 2019 Best Places to Work list. This award recognizes businesses that offer a fantastic work culture and workplace environment that attracts and retains superior employees. EZ Texting is currently hiring for a variety of positions in Santa Monica, CA and Austin, TX as the company charts a course for expansion. EZ Texting has been named to numerous "Best Places to Work" lists over the last decade. It reflects a company-wide commitment to creating a best-in-class culture for its employees. "At EZ Texting we strive to be more than a great platform for our customers, we try to be a great place to work," explains COO TJ Thinakaran. "We put a great deal of effort into offering compensation, benefits and perks that improve our employees' quality of life, such as paying health insurance premiums and gym membership fees. This award recognizes that our efforts are paying off!" Built In LA's "Best Places to Work" list rates companies based on their employer benefits and employee submitted compensation data. Rank is determined by combining a company's score in each of these categories. Learn more about EZ Texting's winning culture on their Built In LA profile page. About EZ Texting: EZ Texting is the #1 mobile marketing platform for business. With over 50,000 customers and 40% of all mobile users in the U.S. consistently receiving communication from our solutions, EZ Texting is revolutionizing how businesses personally connect with consumers. The company simply delivers the fastest and easiest way for businesses of all sizes to delight and engage their audiences through mobile devices. EZ Texting empowers businesses to execute marketing campaigns, send real-time alerts, promote events and provide customer service, ultimately driving higher revenue and adoption for millions of products and services. Text "TRY" to 858585 to see how it works. EZ Texting has continuously been voted a Best Place to Work and is headquartered in Santa Monica, CA with major satellite offices in Austin, TX and Kiev, Ukraine. For more information about EZ Texting or its technology, please visit the company at: www.eztexting.com.